The term abscess is used to describe two distinctly different conditions in dentistry; it refers to either a periapical abscess in the tooth or a periodontal abscess along the gumline. Today, we’ll discuss some general abscess information, especially regarding the sudden pimple-like growth on the gumline that is a telltale indicator of a periodontal abscess. Whichever type of abscess we’re speaking of, it is crucial that you visit the dentist as soon as possible to uncover and eliminate the root cause of the issue. The staff at our Encino dentist’s office will give you some helpful information to identify the potential presence of an abscess and why you should seek treatment – possibly even through a same-day appointment! While determining that an abscess is periapical is all but impossible without the assistance of a dentist, most patients seek treatment quickly, as this type of abscess is typically quite painful. A periapical abscess is basically rot and/or infection below a tooth, found in the root or nerve endings themselves, which is why pain usually precedes other symptoms. While a periodontal abscess is easier to identify from home and often relatively painless, this type of abscess is typically even more severe. A periodontal, or gum-line, abscess is almost always discovered through a somewhat painful pimple-like growth on the gumline itself. Whether a patient “pops” the abscess or not, they will need to seek dental care for the latent infection lying beneath the abscess. Note: It is incredibly ill-advised to “pop” an abscess or any pimple-like growth on your gumline, as ingesting the fluid can lead to infection spreading your body and the now-open sore on the gumline can agitate the infection within further. An abscess is nothing to shrug off, as an infection in your gums is certainly not something you want to mess around with. We’ve become used to the idea that infections are typically not very threatening, as just about any infection can be easily treated with a few antibiotics from just about any doctor, but an infection in your gumline shouldn’t be blown off as especially minor. It is also incredibly important to note that the infection in your gums will not go away on its own, even if the externally-showing abscess does; it will almost certainly worsen over time. To understand why this is, we first have to look no further than the mouth itself. An infection in your gumline puts your surrounding teeth, gums, and even jaw bones and muscles themselves in danger – permanent, irreparable danger. Plus, this isn’t a peaceful, easily-remedied danger, either: If you leave an infection alone in your gums, you could face sudden, intense pain that will likely only worsen over time. Dentists can quite easily treat your abscess and, if caught early, can almost always save your teeth and gums from permanent damage and keep you out of discomfort; the same can’t be said for an ignored abscess that is allowed to grow unchecked. Beyond endangering your mouth, an infection in your gums is actually incredibly hazardous to your overall health. The reason for this is simply that your gums are closely linked to your circulatory system and positioned in a way that makes them more connected to your heart, lungs, and other major organs than many of the other places in your body. A large amount of blood is circulated through your gums before almost immediately heading to your heart and lungs for recirculation in your body. This is worrisome because infection in your heart or lungs can be lead to some incredibly dangerous, even life-threatening conditions. So, if you discover a slightly painful pimple-like growth on your gumline, contact your dentist immediately for assistance. If you’re in the Encino or Lake Balboa area and need assistance, get in touch with our office and we will be happy to assist. As mentioned above, the treatment process for an abscess isn’t as complicated or difficult as you may imagine. Your dentist will begin by carefully cleaning the area, then drain and remove all pus to stop the spread of infection and risk to your teeth and gums, and finally treat the infection itself through cleaning and medication. Often, this could require a small amount of drilling to access areas of the gum that are beneath or behind a portion of tooth; your dentist will often finish this treatment with a root canal therapy, filling, or, rarely, a crown. Very rarely, an abscess will require the removal of a tooth to properly treat. In these instances, patients have usually dealt with, and ignored, significant discomfort over a long period of time. Typically, these abscesses have grown very deep and will require additional drilling through the gum and, potentially, into the jaw bone itself. Accessing the infection is of vital importance, as failing to remove this harmful pus before treating with medication can lead to reinfection and endanger the patient. In any case, your dentist may prescribe you with an antibiotic to continue treating the lingering infection. While not necessary in every case, if you are given an antibiotic, it is crucial that you take the entire prescription as requested and keep your dentist informed on any changes to your tooth or gums. 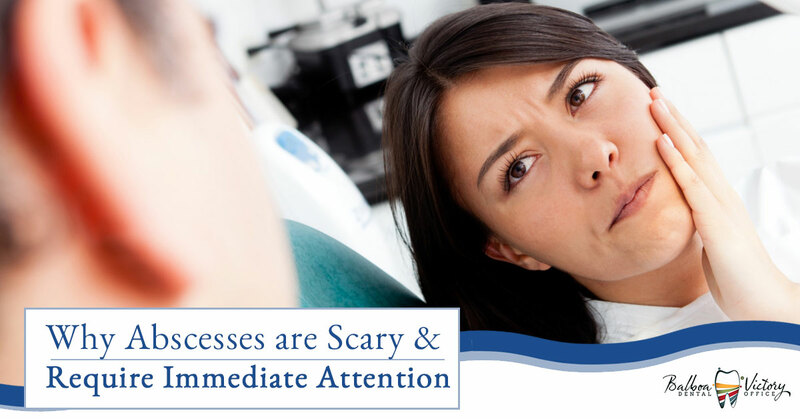 Abscesses are a commonly treated and healed condition, but the discomfort and results available to the patient are often directly linked to how quickly they begin treatment of the condition – so call right away! Get in touch with the friendly staff at Balboa Victory Dental with any questions you may have about our dental care, practices, and other office information based upon any concerns you have for your family’s oral health – we love to answer those questions! At the end of the day, our entire staff just wants to assist your family find the dental care that is best for you, so we’re truly happy to help in any way.